I live in central Ohio, but I work with a surprisingly large number of fellow Texan expats. Just before Christmas I was talking with my coworker Christiane, and of course the conversation swung around to food, as it often does: the good stuff we’re eating around these parts, but also the things we’re looking forward to eating when we get back down South. This year’s especially poignant for Christiane because she’s too pregnant to fly down, and all she wants is grapefruit. “But Mike,” I imagine you saying, “you can get grapefruit in Ohio!” And that’s true… sort of. 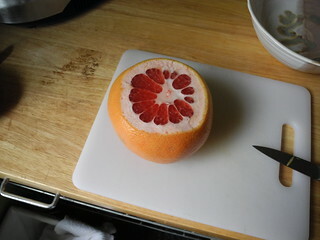 But up here I usually see the standard pink grapefruit, whereas Texans have a special love for red grapefruit: deep red flesh, a perfect balance of sweet and tart. We love it so much we made it our state fruit in 1993. So when Christiane rattled off a skeletal recipe — “grapefruit avocado salad with a little yogurt and honey” — I knew exactly what she meant: the rich, pale green avocado bumping against the dark red grapefruit, all swathed in sweet, creamy yogurt. I nearly left work right then to go find a grapefruit. And when I did leave work, what was sitting in my local grocery store? 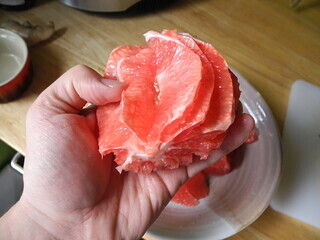 Beautiful Riostar grapefruit from South Texas, a rosy blush on their orange skins. I knew what I had to do. For this recipe, you’ll need to supreme the grapefruit, which sounds very fancy but is actually not that big a deal. 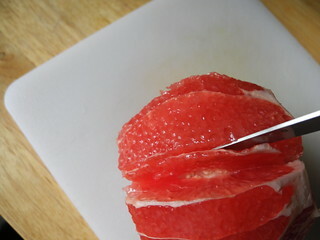 First, cut the ends of the grapefruit away, exposing the flesh and leaving a flat surface for the fruit to sit on. 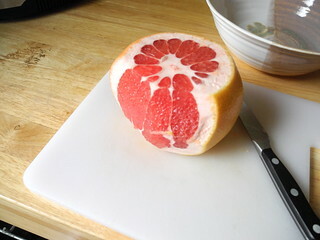 Holding the grapefruit flesh in your hand over a bowl, slice just next to a membrane between segments, then slice down the other side of the segment to release it. If you have a sharp knife and a deft hand, you can actually do this in a single, V-shaped motion, but there’s no shame if you can’t; it’ll taste the same either way. After going through all the segments you’ll be left with bowl full of glistening supremes and a handful of membranes. 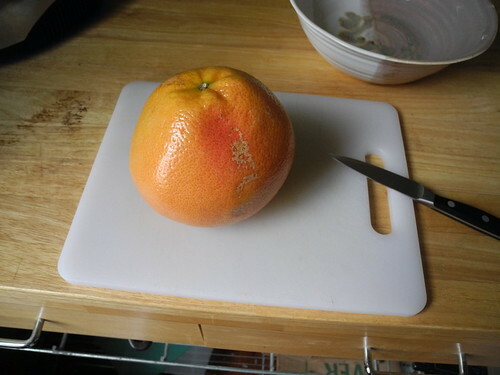 Unless you’re an expert at fruit prep, the membranes will probably still have a decent amount of juicy flesh, which you can squeeze out for a tasty treat. And that’s it! You can treat any citrus this way, but those with sturdier membranes tend to work best. And once you’ve supremed the fruit, the sky’s the limit! For right now, though, I know what I’ll be doing with these grapefruit supremes, staving off my Texas grapefruit longings. Bon appétit, y’all. Supreme the grapefruit (see headnotes above for pictures and further description): Cut off each end, then slice off the peel. Slice along both sides of each membrane to release the segments into a bowl. 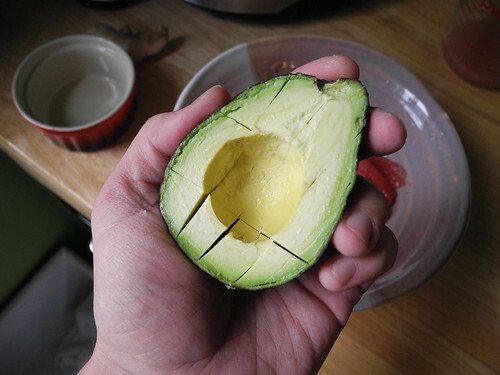 If desired, cut each segment in half to match the size of the avocados. 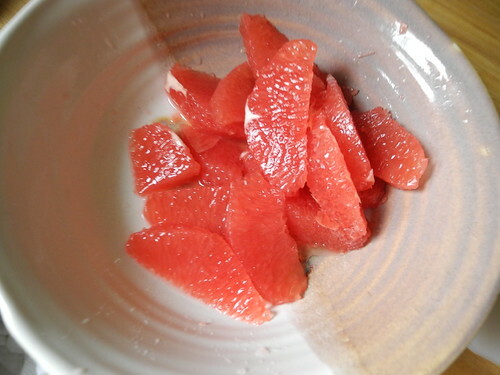 Squeeze the remainder of the remainder of the grapefruit for its juice; you may use a bit to finish the dish, but if not it’s a delicious cook’s treat. Slice the avocados around the pit, longitudinally, and twist to separate halves. Remove pit, cube the flesh in the peel, and scoop the cubes into the bowl with the grapefruit supremes. Whisk together the honey, yogurt, scallion, cilantro, and salt, then toss with the grapefruit and avocado. If the mixture seems a little gloppy, mix in a teaspoon or two of the reserved juice. 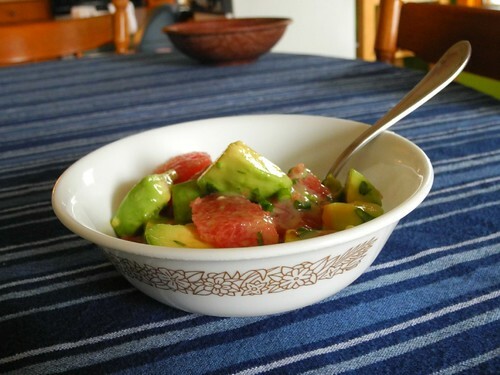 Serve immediately, or chill for a few hours before serving (the dressing and grapefruit juice will help the avocados stay green for a little while, but eventually they will brown unattractively). I promise you, the scallions and cilantro in the dressing play beautifully against the fruit. But if the sweet-savory combo really freaks you out, you could omit them and the dish would still be great. Don’t drop the salt, though: it doesn’t make the dressing salty, but it does kick up the other flavors. You could also go the other way and add some chili powder or powdered chipotle to the dressing, which sounds so nice I might go try it right now. If you’re going that way anyway, you might as well go for it 100% and swap out the scallion for some minced red onion.